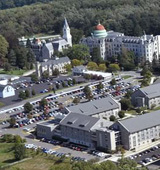 Small, Catholic Neumann University in Aston, PA offers a liberal arts education to about 3,000 full- and part-time students. For fun, students travel to Philadelphia or travel to nearby Valley Forge to take a hot air balloon ride provided by the United States Hot Air Balloon Team. What are the top 3 reasons someone should attend Neumann University? What is a typical Neumann University student like? Describe the type of person that should attend Neumann University. A fun student, who puts school and education first. You have to know how to put fun aside until grades are where they need to be. Neumann now fields nineteen NCAA athletic teams, is home to nine arts groups, and has three residence halls that accommodate more than 770 students. The student-faculty ratio of 14:1 allows professors to provide the personal attention for which Neumann is famous. This expansion of programs and services, coupled with the University's commitment to first-rate academic instruction and real-world career preparation, has caused Neumann's popularity to boom in recent years. What are the top 3 things that students do for fun at Neumann University? Go to the gym, Hang out at the library, or create adventures for friends. We also find things to do while in our dorms, like movie nights, and parties. Campus housing is available for undergraduates. Housing deposit : $200.00. Housing deposit due : Aug 1. Housing deposit is not refunded if student does not enroll.. Freshman allowed to have car. No pets. 70% of freshman live on-campus. The average student pays $25,221 for tuition, fees, and other expenses, after grants and scholarships. Total stated tuition is $23,960, in-state and on-campus, before financial aid. Learn more about financial aid at http://www.neumann.edu/financialaid/default.asp. Estimate the net price for you at http://neumann.studentaidcalculator.com/survey.aspx. The typical (median) early career salary of Neumann University graduates is $42,800, according to Payscale. Neumann University participates in the NCAA Division III for college athletics. Want more info about Neumann University? Get free advice from education experts and Noodle community members. Do you accept a high school diploma certificate from the Corner Stone Christian School? I intend to apply for the nursing program at your university.